What are these streaks on lens element? How to remove? The front of the front element of a lens (Tamron SP 35-210/3.5-4.2 BBAR MC, made 1983-1987) has streaks that are visible only when light is shone through them at some angles. They do not appear to be scratches. The element looks fine in normal lighting. They look like cleaning or water marks, but I cannot remove them. I've tried peroxide, vinegar, 70% isopropyl alcohol, 90% isopropyl alcohol, detergent, water. I left each solution on the lens for about a minute each. What are these streaks? Could they have been caused by improper cleaning by the lens' previous owner? How can they be removed? For those interested, I am unable to discern any effect that may be caused by the streaks. Sharpness, color, and contrast are good. There is no noticeable veiling glare when pointed toward large windows, which affects most other lenses. Upon close inspection of the provided images, it appears that someone has tried to wipe the lens element with the wrong tool. This left light streaks on the surface of the element. From that perspective, you now have several choices from safe to diy depending on the value of the lens (your affect/price). Small streaks like these should not change the lens properties. If you don't mind the lens look and/or don't have the money, the safest solution is to keep it as-is. You probably won't notice it in your photos. If your lens is vintage and you want this lens to have a brand new look, you can ask an optic professional for re-coating the lens (under 100$ but can take a while). Vintage lenses are easier to re-coat than modern ones due to softer and more primitive coating techniques (as opposed to multi-coating, oil free treatment and hard metal based coating). If this lens is not rare and rather inexpensive, you may consider buying another copy that looks good. 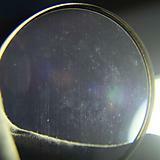 The flare-loving community has a few tutorials on how to remove the lens coating. This lens specialized shop has a good one. 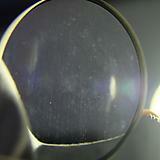 Beware, removing lens coating is an abrasive process, not chemical. It can make your element non-spherical, introducing additional optical aberrations to your lens. This educative page illustrates the process, the result and the risks associated to this kind of operation. Other information may be found in this interesting thread on photrio. I think some damage has been dealt to the lens coating. Without much exception, camera lenses are coated with a thin deposit of minerals called coating or blooming. These super thin coats are applied by placing the lens in a vacuum chamber. The minerals are heated and they evaporate and then condense on the glass. The thickness of the coat is 1/4 the wavelength of light. Their may be multiple coats for controlling the action of different colors of light. Again the coats are super thin, there purpose is to reduce light reflection off the polished surface of the glass. In a multi lens system 50 to 60 percent of the image forming light rays are lost due to reflection. The outside coat is the least important coat. It is unlikely that you will see any performance loss due to this damage. In other words, this is more cosmetic. Don't worry abut it and stop trying to clean the lens surface. Your actions will only result in more coating damage. The straight lines look like mechanical damage from wiping the lens with a cloth with abrasive grains embedded. It could be a desperate cleaning attempt: some of the round spots (when viewed in detail) partly look like fern or developing tendrils. That could well be lens fungus or the damage it dealt out. Don't bring this near healthy lenses. 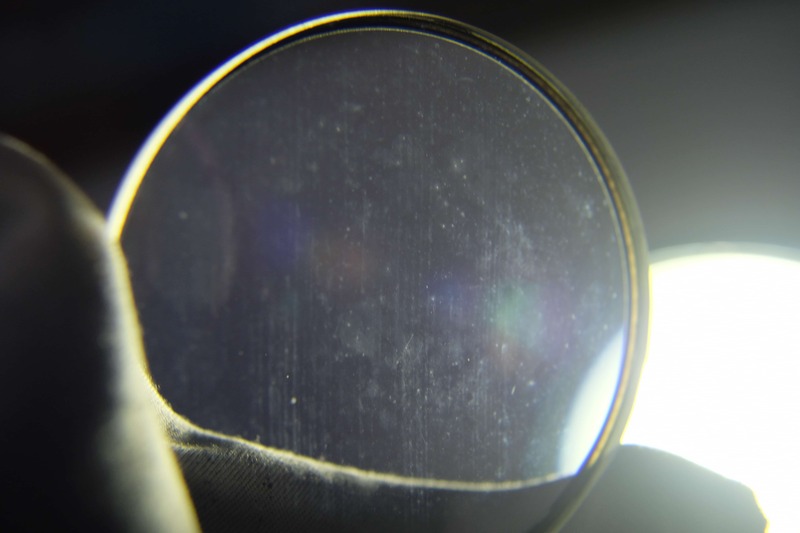 Lens fungus secretes acid that can etch coatings and glass. Screwing this to a good lens can well wash spores into the fittings when you clean it at a later point of time. Not the answer you're looking for? Browse other questions tagged lens cleaning or ask your own question. How to safely clean the rear element of a lens? How do anamorphic lenses produce lens flare “streaks”? What are these blue/purple spots visible underneath the front element of my lens? What are these red markings on this lens? How to safely clean the front element of a lens? What type of lens element is this? Cleaning the rear element of a lens? What is this peripheral haziness on a lens element? What can be done about it? 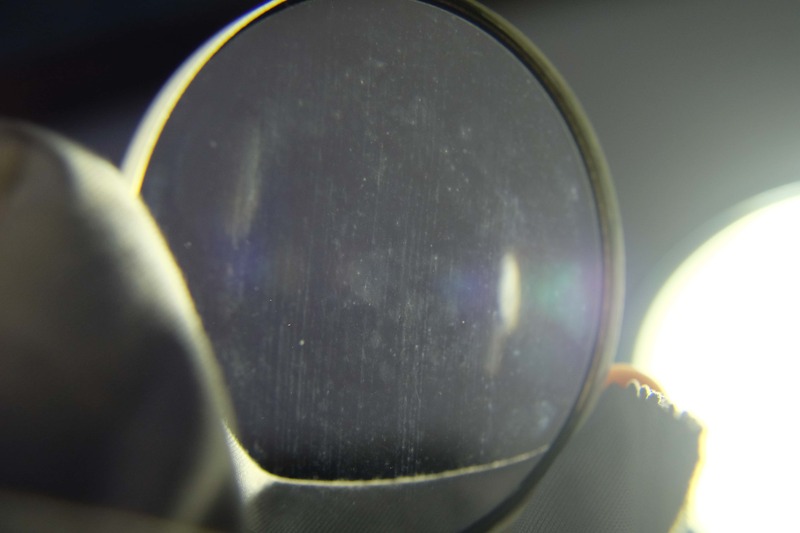 What is black substance on inner surface of front lens element?